Once again architecture firm Tacklebox uses unique materials in their retail store design (see previous post on Aesop’s kiosk here), this time for the new high end OWEN shop in New York City’s Meatpacking District. 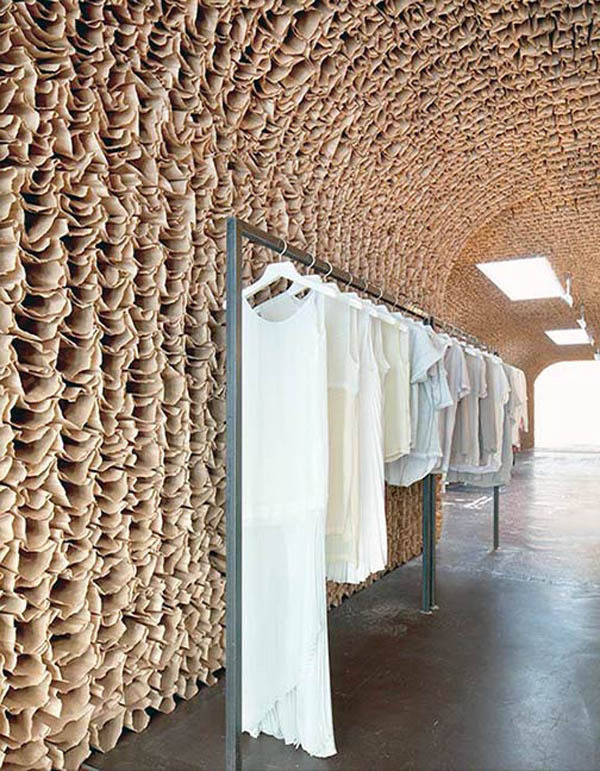 A continuous surface hand-built out of 25,000 brown paper bags, arches from floor to ceiling creating a honeycomb effect within the industrial brick and concrete 1,800 square foot space that previously housed a meat storage facility. This project is the first in a series of signature stores for OWEN and serves as a preview of stores to come. Photos courtesy of Tacklebox by Juliana Sohn. That is a huge difference transforming a meat storage facility into a modern art in a shop front. The usage of the paper bags is unique and have not been commonly seen around before in departmental stores or shopping outlets. It makes the store attractive and exciting which would most certainly entice customers to come inside and take a look around.